Coast Chart No. 109, Boston Bay and Approaches. / Coast Charts 109 & 110, Massachusetts Bay with the Coast from Cape Ann to Cape Cod. 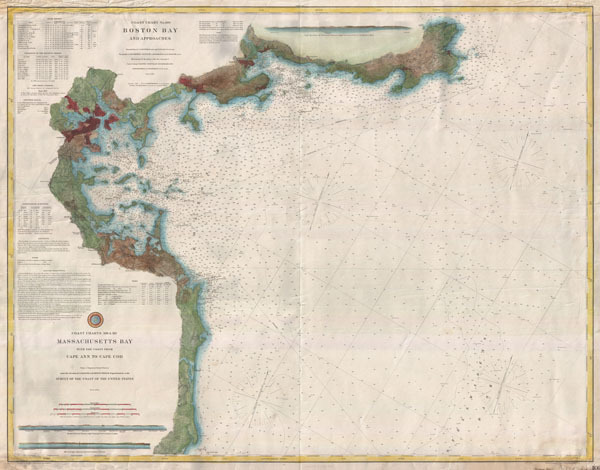 A rare 1877 coastal chart of Boston Bay, Boston Harbor, and environs. Covers the Massachusetts coastline from Cape Ann southward past Gloucester, Marblehead, Lynn, Boston and Cohasset to Green Harbor River. Offers astounding inland detail noting individual buildings, roads, communities, fields, and smaller waterways. There are three shore profile views: Boston Entrance, Minot's Ledge, and Cape Ann. In addition to inland details, this chart contains a wealth of practical information for the mariner from countless depth soundings, sailing instructions, tidal information, lighthouse locations, and notes on magnetic variance. Note this is not one of the more common coast charts issued with the annual Superintendent's Report but rather a rare independent issue chart printed on heavy stock and backed with linen. The triangulation for this chart was prepared by C. O. Boutelle and Capt. T. J. Cram. The topography by H. L. Whiting, G. B. Gluck, A. M Harrison and R.M Bache. The hydrography was accomplished by a team under the command of C. H. Davis, C H. Mc. Blair, C. R. P. Rodgers, W. G. Temple and H.S. Stellwagen. The entire production was supervised by Carlile Pollock Patterson, Superintendent of the Survey of the Coast of the United States from 1874 to 1881. Very good condition. Light overall toning. Minor creasing and damage to upper left and lower right margins - does not extend past colored border, see photo. Original linen backing. Else clean.